Owner Joey Hawkins has been in the business for nearly 20 years, after starting out with two crock pots, a fridge and some tables. Now, locals pack the small shop, nestled in the Watson Village Shopping Center, at both lunch and dinner time. 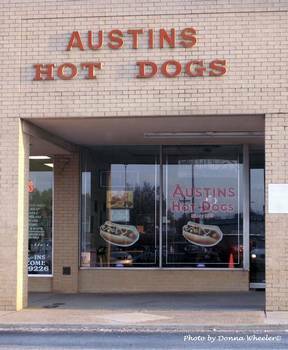 A standard all-the-way dog at Austin's includes chili, mustard and onions, and the homemade cole slaw is also a big hit. Jeans and a T-shirt are the casual elements. No alcohol and no smoking permitted. Lunch and dinner are served with a casual, laid-back atmosphere. Take out is available, but it's fun to people watch, as Austin's Hot Dogs overlooks the parking lot of the shopping center. Hours: Monday - Saturday: 11 a.m. - 7 p.m.
Specialties: Cheddar cheese dog and hot dog "all the way"